This weekend I found myself with an abundance of fresh cilantro on hand. Most people either love it or hate it, yes? I fall into the “love” category. Like, absolutely, always-on-hand, put-it-in-everything, l.o.v.e. My first thought was to make some Chipotle-like cilantro-lime rice to blog about but found out that a lot of people have already done that. Instead, I started brainstorming other ways to use this fun flavor combination. One glance into my pantry and the decision was made – cilantro-lime popcorn. I loved it before I even tried it. 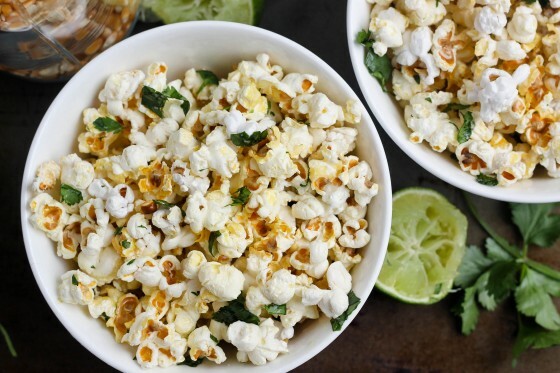 I’m not sure why I hadn’t thought of it before – buttery popcorn with sweet, fresh cilantro and tangy, tart lime juice – snack (or dinner) perfection! Now I am fixated on coming up with more fun popcorn flavors but we will start here. While I do love enjoying a bowl with just butter and salt, I love mixing it up by adding in some fresh flavor every now and then. 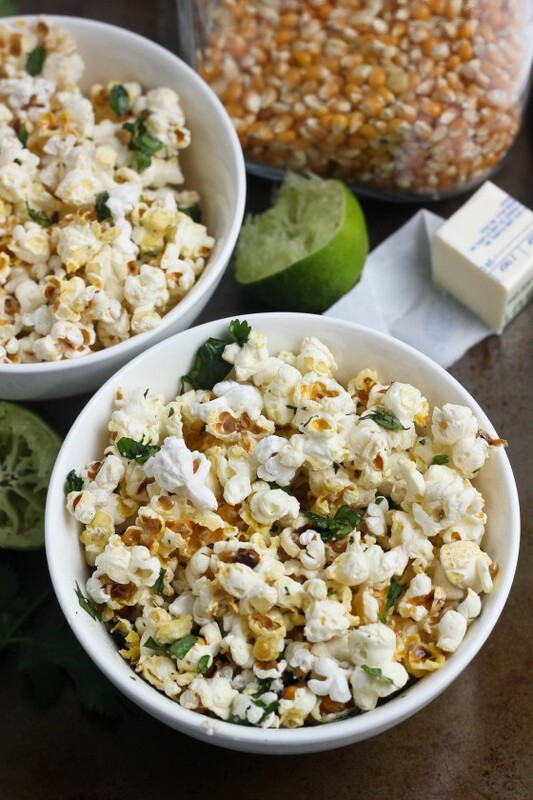 Buttery, stove-top popped popcorn with a Tex-Mex twist of cilantro, lime and salt. While the popcorn pops, melt the butter in a small sauce pan over medium heat. Add the lime juice and cilantro and stir well. Remove from heat. Add the popcorn to a large bowl and pour on half of the butter/lime/cilantro mixture and shake to distribute. Repeat with the rest of the butter mixture. Add the salt and shake again until well mixed. I am popcorn fiend and I love this combo!!!! I haven’t had popcorn in ages, homemade or otherwise! Love this combination. I eat popcorn at least once a week – what a brilliant idea!!! Now can you get my husband to like cilantro?? What a great idea! 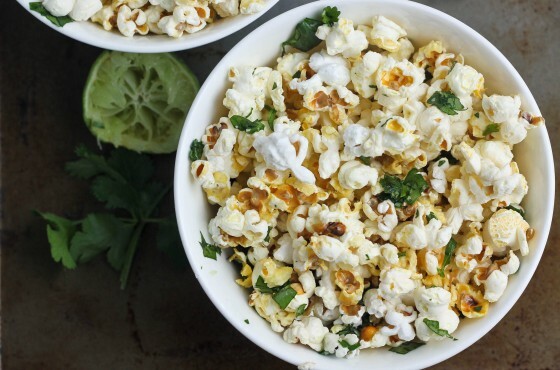 I already LOVE cilantro and lime together – how awesome to add to popcorn!!! We love popcorn as a snack! We will have to try this one. Your sriracha ginger popcorn is one of our favorites. I’m totally in love with this! So in love with this!! I need to make this ASAP!! I fall into the “love” category with cilantro, too, and I am totally diggin’ this popcorn! Love that this is a savory type popcorn! I cannot tell you how much I love this. I’m definitely making this one!! I just bought a chipotle flavored topping for popcorn but now I can make my own. I love the cilantro lime combination! Love that you added it to popcorn! Cilantro is my favorite herb. ever. I’m totally “meh” about popcorn. But cilantro and lime…LOVE. So now you’ve got me craving popcorn and that’s impressive 😉 Love this! what a fun popcorn topping! my husband isn’t a huge popcorn guy, but he did like a sweet & spicy srircha popcorn i made a few weeks ago. i wonder if he’d like this! LOVE this Spring-y take on popcorn, Cassie! So fresh and flavorful! this is my dream popcorn, Cassie. 🙂 I cannot get enough cilantro, ever. I eat popcorn like it’s going out of style. This is such a great flavor combination and it was brilliant to add it to popcorn! I just ate a ton of popcorn for a snack last night..more than my usual and oh, it was so good! I have it almost every day and love that you love it too! I even have a popcorn board which this is being pinned to! I love everything about this! I love pop corn, but I tend to burn my pans making it on the stove. I’ll have to try grape seed oil next. I’ve been putting it in brown paper bags and popping in the microwave. This is beyond heavenly. There is seriously nothing better than stove-top popcorn. Popcorn is my favorite snack too so I’m SUPER excited to dig into this! Love this, two of my favorite flavors! One of my favorite flavor combos and I FULLY support Popcorn as a meal!! Dinner especially! I am so making this soon! Yes! Totally loving this flavor combo! I need to get on the popcorn bandwagon! Oh my… this looks amazing. I love making flavored pop corn at home, and this flavor combo has my name all over it!!! 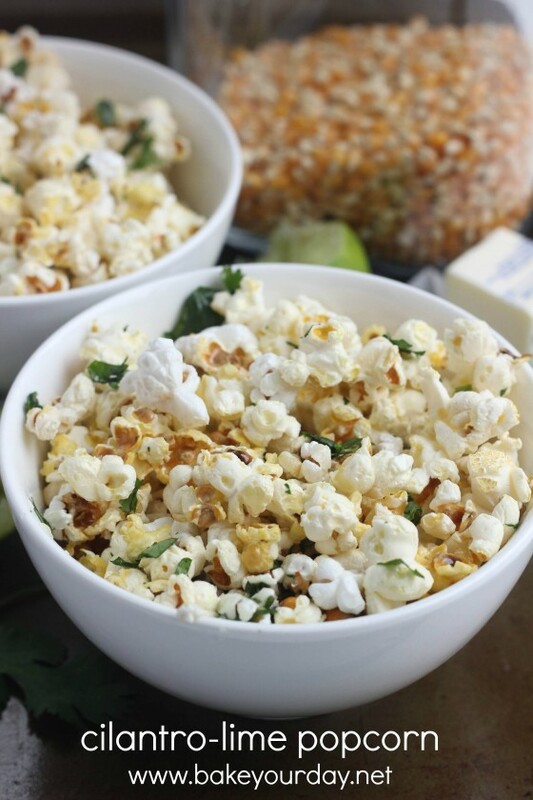 I love cilantro and lime and of course popcorn, this looks magical! What a great idea! Im not in love with the standard butter and salt on popcorn so im gonna have to try this. I ADORE that cilantro lime combo also! I could prob eat that whole bowl of popcorn if left alone with it. I love cilantro too! Definitely trying this one. I love homemade popcorn and I too, put cilantro on e-v-e-r-y-t-h-i-n-g! This is such a great idea! You are a genius for coming up with this! And being the crazy snacker that I am, I know I won’t be able to put this popcorn down until I finish every last bite! I definitely like cilantro and think this sounds amazing on popcorn. Yum! Cilantro & Lime popcorn, what an awesome idea 🙂 I love this! I’m a cilantro head through and through and topping popcorn couldn’t sound better. Woah, this sounds good! I usually lean toward sweet or simple salty popcorn flavor combos, but this savory one is on my list to try now! This post really has my mouth watering. It looks truly amazing! Ooh, hello most perfect snack ever! I love this! I love cilantro. This is on my must-try list! I cannot wait to do this tonight. I love playing with flavors of popcorn. I agree that stovetop or campfire popped cant be beat. I am famous (within my family anyway, hahaha) for my hot popcorn. Just add chili oil to the regular oil for popping, about half and half. After it is popped sprinkle on salt and cayenne pepper. It give the popcorn a nice slow burn flavor. Addicting to say the least. I had to come back and tell you how pleased I am that you went the way of the POPCORN with your abundance of cilantro instead of rice. These flavors with rice is very nice and expected, but on popcorn? That is new and smart. I finally had an opportunity to pop some and I cannot even tell you how giddy I was after eating the first few handfuls. Hahaha. As I said in a previous comment I love to play with popcorn flavors and my spicy corn has always been a family favorite. That is until this one has joined the ranks. I am going to have to make equal amounts of both now to satisfy my popcorn nuts at home. Thankyou for an idea that I would not have come up with. OMG. I just scarfed down an entire bowl of this by myself! It was a meal unto itself…I’m stuffed! I subbed out the butter for coconut oil and reduced the amount by half. It was SO DELICIOUS! The combination of flavors set my tastebuds dancing! Pingback: Dizzy Busy Digest 6 April 2013 «Dizzy Busy and Hungry!